A simple way to back up items from your user account is to copy them to an external disk. To see how much stuff is in a folder in your user account, click the Start button and then click your username. Then point to the folder you're considering backing up, or right-click that folder and choose Properties. When you point, the size of the folder shows in a tooltip. When you right-click and choose Properties, the size of the folder shows up next to Size on Disk in the Properties dialog box (see Figure 1). Figure 1. A folder's size in tooltip (left) and Properties (right). Folder sizes show in tooltips only if you selected Show Pop-up Description for Folder and Desktop Items in the Folder Options dialog box. To see how much space is available on a disk, insert that disk into the appropriate drive on your computer. Or if it's a flash drive, connect it to a USB port. Then open your Computer folder. With some kinds of drives you'll see the amount of available space right on the icon. For example, drive C: in Figure 2 has 32.4 GB free, the DVD in Drive D: has no free space left, and the remote network disk drive Z: has 3.01 GB free. If there is no meter, choose View => Tiles from the toolbar. 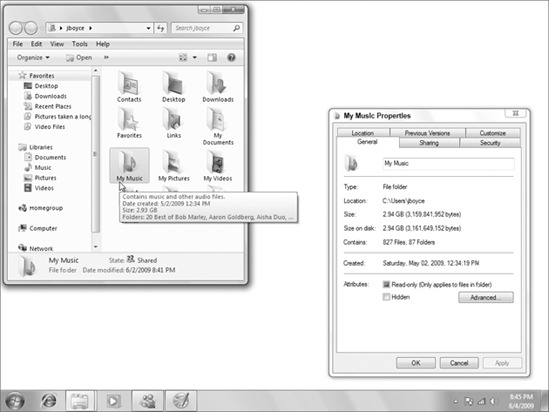 Or right-click the drive's icon and choose Properties to see the amount of free space in the Properties dialog box. Remember, 1 KB is 1,024 bytes, 1 MB a little over a million (1,0242), and 1 GB about a billion (1,0243). Figure 2. 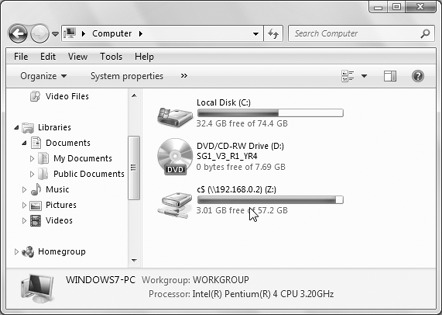 A disk's available space in the Computer folder. If there's enough space on the disk for the item you want to copy. Should you ever lose or damage a file on your hard drive, you can get it back from the copy that's on the external disk. It's difficult for me to tell you how to back up your e-mail messages because dozens, if not hundreds, of different e-mail services, and multiple e-mail clients exist. They don't all work the same. In fact, e-mail really has nothing to do with Windows 7 at all. It's a service provided by your ISP or mail service provider. Your only real resource for information on that is the tech support provided by your ISP or mail service (or someone who happens to use and know that same service). If you use Windows Live Mail, you have some simple ways to back up important e-mail messages. One is to use the Backup and Restore Center described in the next section. Another is to simply copy your entire message store folder to another disk. You can find out where that is from the Maintenance button in the Options dialog box for Windows Live Mail . Optionally, you can save just your important messages as files. Create a folder, perhaps named Saved Messages, in your Documents folder. Then save copies of important messages to that folder. You can do so by clicking the message header and choosing Save As. Then specify that folder as the place to save the message. Or, just drag the message header out of Windows Live Mail and into that Saved Messages folder. Each saved message will be a file with an .eml extension and an envelope icon. To back up your saved messages, just copy that Saved Messages folder to an external disk. That's the quick-and-easy way to make backups of important files. More elaborate methods exist. The next two sections discuss ways of backing up all your files, and even your entire hard drive.